Another Publication that caught my eye, published just before EcoBuild 2013, is Huw Heywood’s 101 Rules for Low Energy Architecture'. I first met Huw at the RIBA Guerrilla Tactics Conference where he did an eloquent talk about low energy architecture, synthesising his experience from practicing in the UK and abroad. His presentation contained clear, beautifully drawn sketches and I pre-ordered his book the same day. Huw Heywood has a tremendous insight and rare skill to synthesise the issues designers and students need to consider when starting a design project. 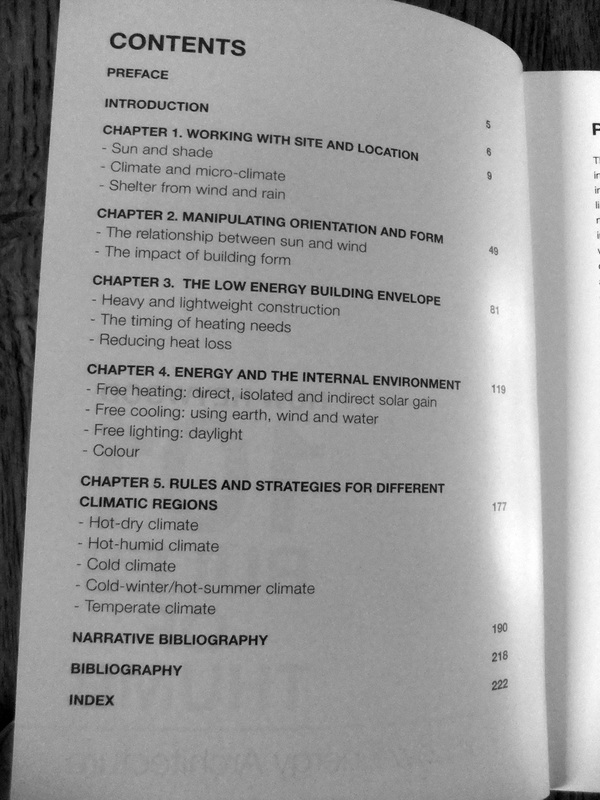 It is a delightful little book with beautiful drawings and easy to understand text; covering the basic design rules for different global climates, emphasising simple rules for sustainable building but also highlighting some intuitive, forgotten knowledge. As each rule is limited to a double-sided page in this 200-paged book, and as it applies to different climates, inherently lots of detail cannot be provided. As an advanced environmental designer, this left me wanting for more, but there is a more detailed bibliography narrated by the author in the appendix and with further reading links too. I would have preferred this narrative alongside the diagrams, but as it is a concise book, it is easy to dip in and out and back and forth to the bibliography, aided by a lovely back flap to bookmark. In the same way that Heywood recommends the use of a compass (Rule 34) as essential to an architect's job; '101 rules' is an essential tool for all architecture students, architectural educators and those new to environmental design - wherever they are in the world. I also did a review of Gething's Design for Climate Change book here.